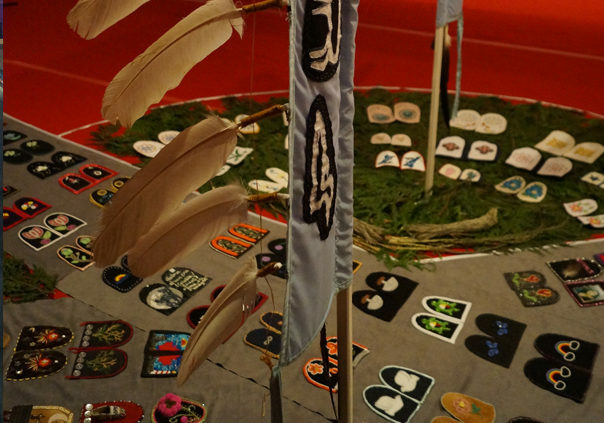 From June 1 to 21, 2015, the Red Deer Museum + Art Gallery hosted Walking With Our Sisters, a memorial installation that pays tribute to the lives of missing and murdered Indigenous women. With support received from the Red Deer & District Community Foundation, Red Deer Aboriginal Employment Services, Red Deer Native Friendship Society, Elders from our own community, and from the O’Chiese and Sunchild First Nations Bands, as well as over 270 volunteers, the Museum was transformed into a sacred space to honour and grieve for those taken from our lives, our communities, and our nation. Creating the sacred space in the exhibition galleries was an incredible undertaking that involved ten volunteers working twelve hours a day for four consecutive days. Once completed, over 1,800 pairs of vamps (or moccasin tops) were carefully placed in the lodge, along with sacred items that will come to the bundle, two eagle staffs, an eagle fan and feathers, drums, rattles and a grandmother’s pipe. 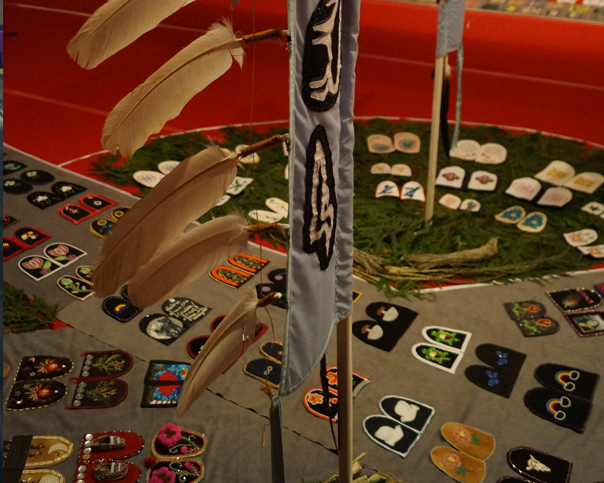 Guided by First Nations grandmothers or “Kokums,” as well as women with traditional teachings, visitors removed their footwear, smudged, and took a pinch of tobacco and held it in their left hand (closest to the heart) while they walked through the sacred space. At the end of each day, the tobacco was offered to the Creator by a sacred fire. For some, that was their first introduction into Native Spiritual Practice. For others, it was a returned tradition, one that was once outlawed by the government. In the months leading up to the memorial opening in central Alberta, the Red Deer Museum + Art Gallery hosted a Community Conversation once a month, panel discussions, film screenings, and fundraisers in collaboration with The Hub, Red Deer College, and Hunting Hills High School to raise awareness about an often neglected travesty of justice. RDDCF was honoured to be a part of this meaningful, memorable tribute.